By the turn of the 20th Century fly fishing, as a sport, was increasingly popular among the social upper crust of the day. There are numerous volumes that detail the exploits of the well-healed gentry spending time at their private fishing clubs or traveling in their private railroad cars to the North woods to spend a few days angling. Those were the days of excesses, and success was measured in numbers of fish killed with little regard for the resource. 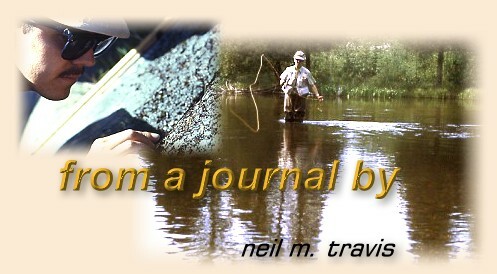 Fading photographs and faint writing on the yellowing pages of old fishing diaries and angling logs tell the sad tale. Fly fishing was rarely the sport of the common man. The basic equipment necessary to pursue the sport was relatively expensive when compared to the tackle that was used by a bait fisherman. Much of the jargon used by fly fishermen was foreign to the average man, and the degree of skill necessary to master the art of fly fishing was beyond the time available to the working class. It took little time or skill to bait a hook and heave the wriggling offering into the nearest body of water. Much of the equipment could be made by hand and what could not readily be obtained around the house could be purchased for a minimal outlay of cash. The equipment was cheap, readily available, and the results were positive. Many an evening meal has been secured by a hook baited with a worm attached to a cane pole by a length of string. With the death of Theodore Gordon in 1915 American fly fishing entered a new phase. New names appeared, and one of the early men that began to fill the void left by Gordon was George La Branche. In 1914 he published The Dry Fly and Fast Water, which helped to codify the American concept of dry fly fishing. La Branche advocated fishing the water rather than casting to a specific rising trout. He was a champion of casting accuracy and control, and in his custom waders, English fishing hat, and Leonard rod he cut quite a dashing figure on the Catskill trout streams. In 1916 Louis Rhead made the first American attempt to show a relationship between natural flies and artificial when he published his book American Trout Stream Insects. Unfortunately he used common names, many of his own invention, to describe the insects and his drawings were far from clear. Due to these problems the insects that he collected and depicted in his book are virtually impossible to identify with any certainty, and his work has little value today. One of the giants of this period was Edward Ringwood Hewitt. In 1926 he published Telling on the Trout, and over the course of his life time wrote several important books including a book on trout stream management Better Trout Streams published in 1931. Hewitt was a tireless innovator inventing the dry-fly spiders, bivisibles and the famous Hewitt skaters. He conducted experiments with leader color and taper and early proto-types of flat bodied nymphs. In addition to Telling on the Trout he authored a Handbook of Fly Fishing in 1933, a pamphlet entitled Nymph Fly Fishing in 1934, and A Trout and Salmon Fisherman for Seventy-five Years in 1948. It is tragic to note that Edward Ringwood Hewitt spent most of his angling career on the Neversink River in upstate New York at the Big Bend Club. Most of his property and the famous river are now buried under the depths of the Neversink Reservoir that provides drinking water to the thirsty millions in New York City. In 1934 Preston Jennings published his Book of Trout Flies, and provided the first truly modern American book on trout stream insects. Jennings collected insects from all the major Catskill trout streams including the Ausable and Battenkill Rivers in northern New York. From these collections he tied exquisite imitations in the Catskill style, and many of his patterns are still used today. John Alden Knight, an early proponent of the solunar theory of fishing, published his first book, The Modern Angler in 1936. This book paints a vivid portrait of the trout fishing practices of the thirties and contained an exposition on the solunar theory. In 1940 he published Theory and Technique of Fresh Water Angling and in 1944 he published The Field Book of Freshwater Fishing, which was essentially a rehash of his former writings. His last book was a collaborative effort with his son, Robert Alden Knight, and was entitled Complete Book of Fly Casting. Despite the fact that it was published over a half century ago it remains an excellent book on the subject of fly casting technique. In 1938 Ray Bergman published his first book that he simply entitled Trout. This book was to become the most comprehensive book on American trout fishing that had been published up to that time, and remains the most complete work of its kind even to this day. Bergman covered the entire gamut of fishing for trout from wet flies to dry flies, and even bait. In a very casual, almost conversational style this homely style of writing had a warm personal charm that still resonates with modern readers. There were a number of books published during this period about fly tying. Reuben Cross published Tying American Trout Lures in 1936, and in 1940 Fur, Feathers, and Steel. James Leisenring published his little-known book The Art of Tying the Wet Fly in 1941. Although a very important book it was overshadowed by the events of World War II that ended all thoughts of angling. In 1947 Art Flick published his little book Steamside Guide to Naturals and Their Imitations. In 1950 Vincent Marinaro published Modern Dry-Fly Code, which is considered by many as one of the most important books in the history of American fly fishing. His jassid-style imitations of terrestrial insects and his thorax-style dry flies are innovations that are unique examples of a brilliant mind. This was further demonstrated in his theories of light pattern and silhouette on insects in the surface film.